I’m so excited it’s Friday because I have the best book to share with you today! 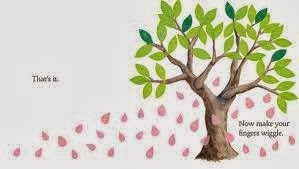 Links To Resources: Classroom activities, draw pictures of different kinds of trees – apple trees, pine trees, what else can you think of and how can you make them look different from each other? Talk about what trees wear in different seasons (and how some trees (deciduous) lose all their “clothes” and others (conifers) don’t) and compare to what you wear in different seasons. Project Plant It: Trees For Kids And Their Communities. Why I Like This Book: Who needs an app for interactivity? This book has it all. 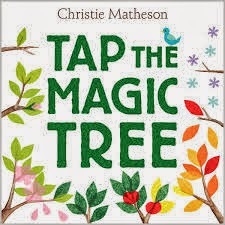 Tap the tree to make the leaves come out. Rub the tree to make it warm so it blossoms. Jiggle the tree and wiggle your fingers to make a rain of petals. Brush the petals away and blow the tree a kiss to make apples form. The reader is in charge and gets to do all the activities. So clever and fun! I hope everyone is hard at work on their Halloweensie Contest entries and that you’re all doing better than I am (since I haven’t yet had time to start!) It’s so exciting! I can’t wait to read what everyone comes up with. I look forward to reading this book. I agree one thousand percent: “It's one of those “man-I-wish-I'd-thought-of-that!! !” books :)” I saw a book trailer for this and it reminded me of Press Here by Herve Tullet. I think the change is a great idea. I received a pile of library books from last week's PPBF list and well, they are perfect. Look forward to this week's list. What a very clever interactive book. Looks very colourful too. Thank you for sharing Susanna. Have a great weekend. You and Enzo will really like it, I think! The concept is simple, but so clever and fun! Now you've got me curious, Susanna! I'll have to check this one out. How creative. As for the contest, I need to get MY creative juices flowing. . .
What a very interactive story. That's the kind of thing that can really grab and hold a reader's attention. I saw this book at B & N. What stopped me was wondering what if the kids DON'T want to participate? If you turn the page without rubbing, touching etc. and the action still happens, the seasons change, does it ruin the magic of the story format? I know I am probably way over-thinking this. So is this an app or not? It seems like it is. Love the sound of it and how it works. Since I don't own a tablet I can't “read” this but can borrow one from the library so maybe I can after all. I'll let you know. Or do you have to buy the apps before reading them? Yep, I'm ignorant. Fill me in ok? I love the idea of this interactive book. It looks like a great addition to a preschool classroom. Then they could take a little nature walk. Fun! I saw the app somewhere online it looks awesome. And who doesn't love trees. Great choice for fall. A very creative idea for an interactive book depicting the seasons. I like the use of magic in the title. Because the seasons of growth are so magical. Such a lovely book for young children! Nice choice with the trees changing right now. Whether or not you hold PPBF on Nov. 1, I will probably post something anyway. Still waiting for this one! What a fun interactive book! Wish that had been around when my kiddos were babies. I wanna play with that book! It sounds like such fun. I am totally in agreement with skipping PPBF on Nov 1 — good idea to devote that week entirely to the Halloweensie contest. I have written my story (unless I edit it, it's EXACTLY 100 words) and can hardly wait for the contest time! I'll be posting mine on October 30th. Sounds like a wonderful book! Thanks so much for posting! This really sounds like a fun book. I will be checking this one out for sure. Don't worry, you'll have plenty of entries for the contest. I know of at least one entrant who is THRILLED to participate again. Hi Susanna! It's been a while since I last posted on your blog. I've been really busy lately, but I just want you to know that I still follow your blog and that I really appreciate all your comments on my own blog. I hope to make some time for this Halloween contest! Your contests are always so much fun. Sounds like Touch Here. Same sort of interactive picture book. Following the directions makes things happen on the next page. Fun. And yeah. “Why didn't I think of that?” is my middle name! It is a fun one, Rhythm! I agree! I think especially little kids will love having an active part in the story! Glad to have you here earlier, Vivian! And your maple tree story sounds very cute! Take it out and see what you can do with it! Since I am behind schedule replying to my blog comments, I have already read your interview with Iza and it was terrific! A hard act to follow! I've read this book and I think it's fabulous! I'm going to enter the contest, Susanna:) I found a few moments to work on it!